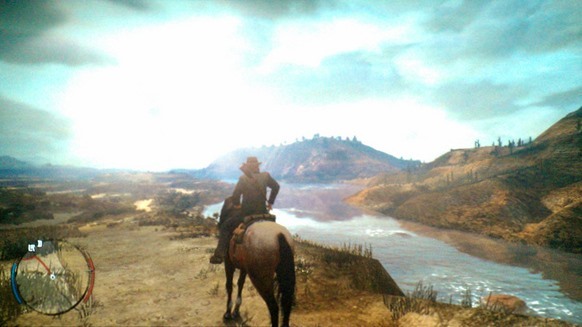 Finished Act 1 (3 total) of Red Dead Redemption and it was disappointing. The act is divided into five important people who you have to do missions for in order to progress the story. Around five missions per person on average. Only Bonnie and the Marshall's story missions felt tied to the storyline. Dickens, Seth, and Irish's missions felt like they added nothing but padding to the game. Add that nothing that you do in the game affects the world around and it's like you never existed in the game. First thing to address is the sloppy storytelling. Jumping from one mission to another, it feels like the information presented to you is fragmented or not well laid out. John needs to kill Bill, but they never really say how he came up with the plan. There is no origin in the plan to infiltrate Fort Mercer, it was just something that the characters suddenly started planning. Going from mission to mission, you often questioned if this is necessary at all. 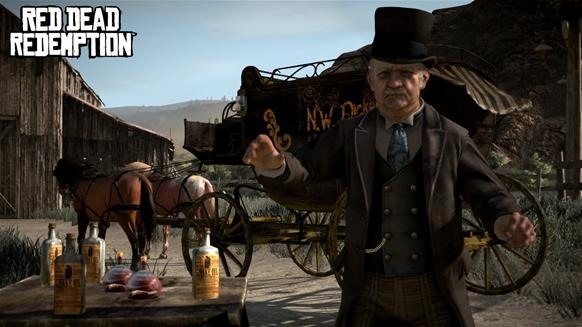 John Marston is part of the problem of why the story is so bad. He is the definition of generic. There is nothing that defines him as original or different than other characters. John never contributes or comes up with his own ideas, he always takes the advice and planning of others. He doesn't have a style or a personality, and he doesn't take initiative in anything. There is no conversation where he takes the lead, even the characters who are not all quite there (crazy or drunk) take command of the conversation. All John ever does is follow, it is like looking through a character and finding nothing there. Nico in GTA 4 was more outgoing, led in conversations and jokes, and overall felt like a character that you liked watching or interacting with. With John, not so much. This has been talked about before, but it is disappointing that what you do does not matter in the game world. Things are always static in location and characters. If in a mission, a ranch is wiped out or a tragedy happens, the second the mission is over everything goes back to normal. If you clear a gang hideout it will be there the next time you go there, fun for game play purposes but a bit disconnecting if you want a continuing living world. 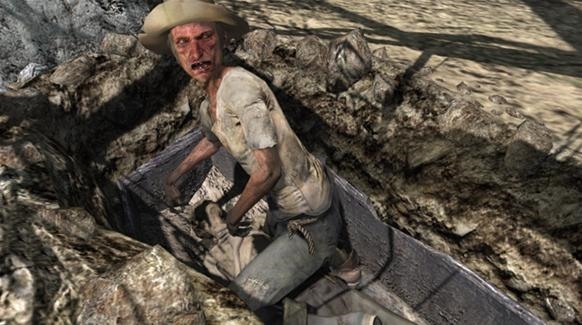 Oblivion and Fallout 3 has sandbox worlds and keeps the consequences of your actions (if you wipe out a town, it stays that way), it is sad that Red Dead can't deliver in this aspect. The lack of non generic NPCs and interaction options is also troublesome. There are no NPCs that can't be replaced by others. The store keepers are generic, and so are the town people. There are no recognizable characters with their own story or progression. If you meet special 'strangers' that need your help, they disappear once you finish what they ask, there is no follow up. There are no options to do anything with people other than killing them. You can't steal, barter, command, friend, anything. 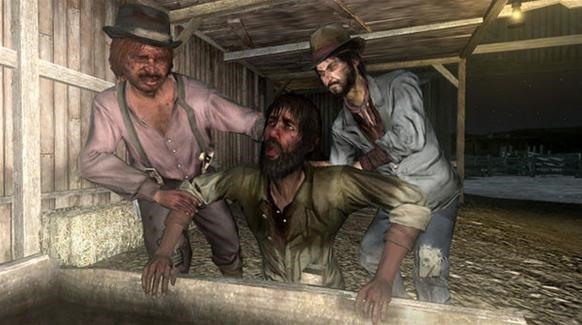 I wouldn't mind being able to create my own NPC posse, or having the ability to buy and work my own farm. There are some really missed opportunities here. The end of Act 1 leaves a sour taste, another "Sorry, but your princess is in another castle" ending. The person that you worked so long on random missions on was not there, and you head down to Mexico. It wasn't a particularly epic fight at the end of Act 1, and going down to Mexico feels like this is going to repeat, starting from nothing again. There is a lack of motivation because the man you are hunting is a moron, and John is the fool who can't keep up with him. If was a better nemesis or target then maybe it would be more interesting, but at this point it's kind of sad that a brainless character is leading the player around.